As I mentioned in my last post, I have been having an extra rough few weeks. 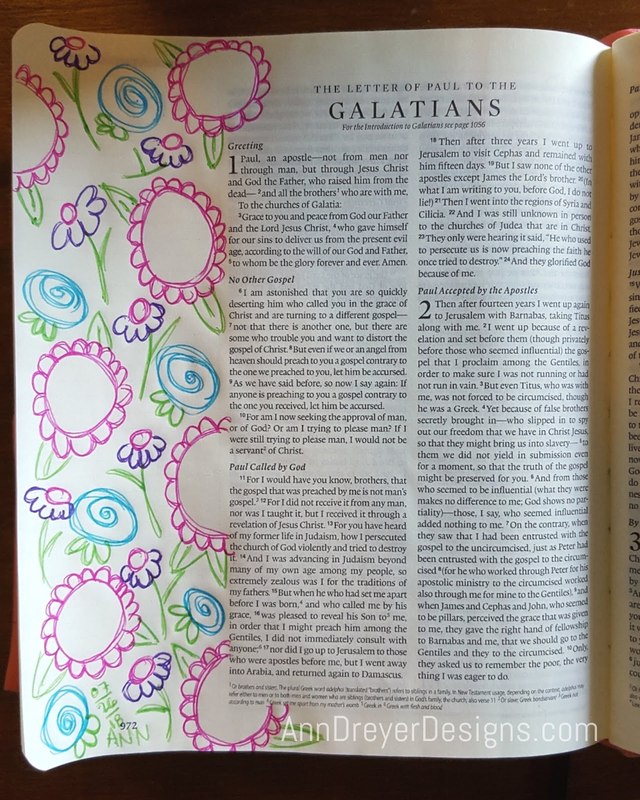 But on two different evenings last week, the heat broke just enough for me to sit on the porch and mindlessly doodle in my favorite Bible with my favorite pen. 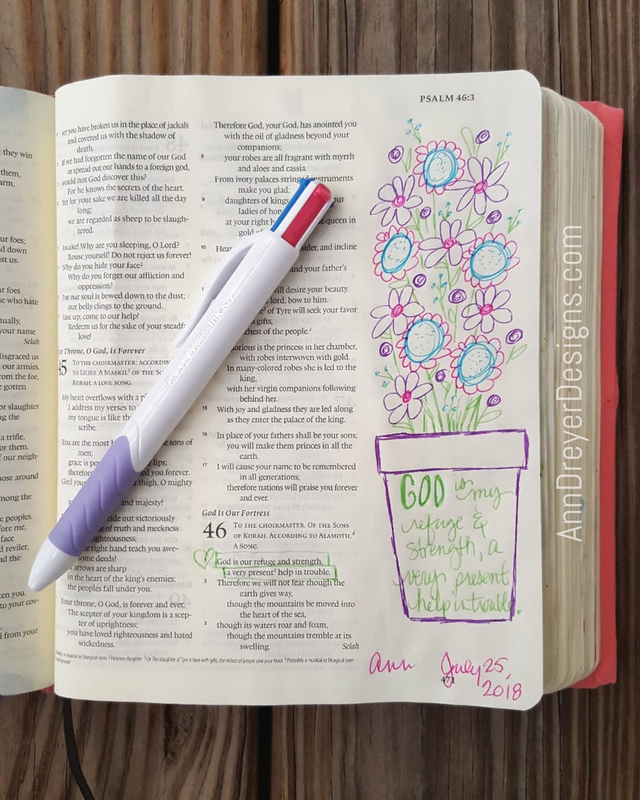 I shared on Instagram that growing up in the 80's, my mother usually had one of those Bic pens with four ink colors and a blue barrel. Years ago, I saw them at our local grocery store and bought one out of nostalgia. 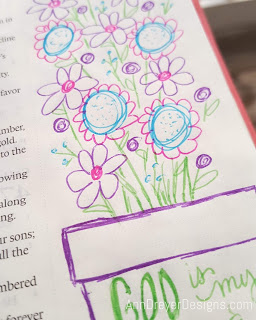 Then I saw that Bic had a special Spring edition with pink, purple, blue, and green inks! My color palette! I used them to journal for years and then PaperMate came out with their InkJoy line which included 4 color pens! 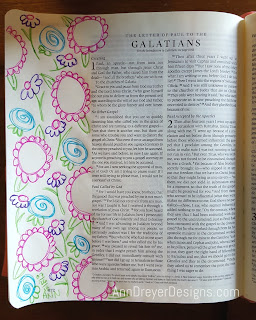 The ink is more like a gel... thicker and glides smoothly. 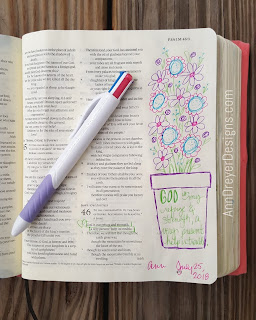 And last week I grabbed my pen and Bible and headed outside for a minute of quiet. They do show a bit of bleed through on the other side of the page, but that is easily covered by adding acrylic paint or paper embellishments to that side. 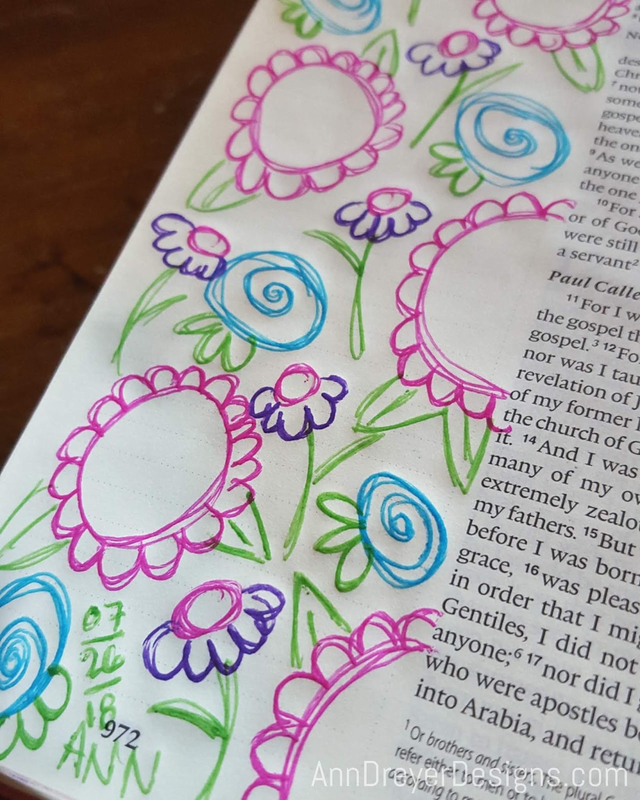 As I was doodling my little daisies and coneflowers and roses, I teared up a bit. I miss my mom and this new season I'm in has me longing to be a responsibility-free kid in the simpler times of the 1980's. And instead of remembering the hard times, I fondly remembered the sweet things my mom used to do to try to help me not be so scared all the times... little gifts in my lunch, funny stories about the cats on the ride home from school, her providing creative opportunities for me. I wish I could go back and tell my little scared, sad self to not be scared and sad and to enjoy this time because life tends to get more complicated as you get older. But I can't. But I can do what I can to enjoy my time now and provide a fun, secure, loving, creative, safe home for my daughter. And even enjoy mistakes along the way. 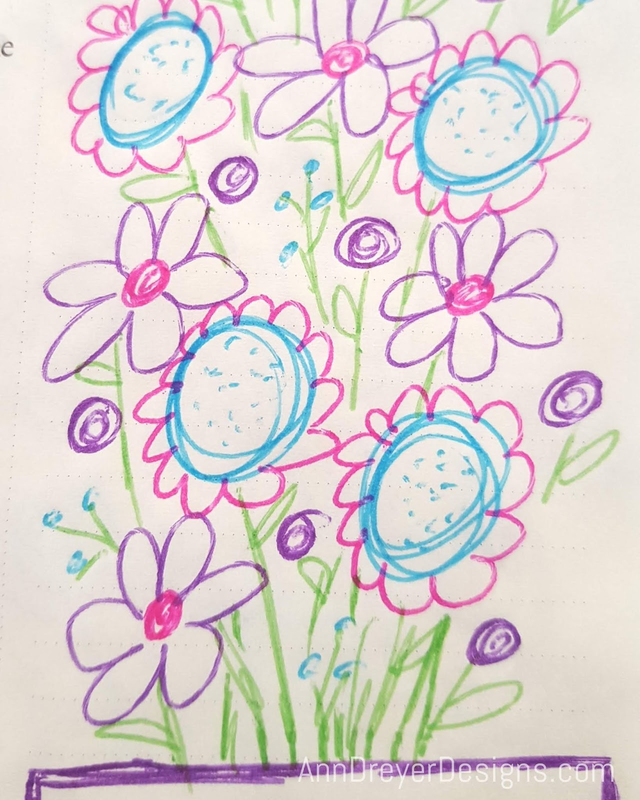 I initially drew these flowers with just one line but then botched up the one at the top. So I implemented a fun technique from Joanne Sharpe and went over each line 2 more times and it gave a fun new dimension to my doodles. 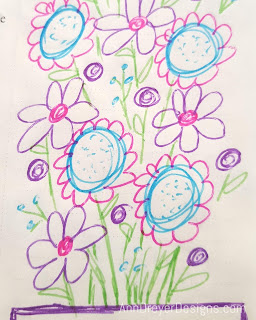 Fun note, I took Joanne's Bloomin' Doodles class the summer we moved to North Carolina and I was pregnant and super sick. I would sit by the pool at the apartment and listen to the class on my phone while doodling in my notebook from the drugstore up the street (I couldn't drive because of OCD) and try not to get sick. I should probably go back and listen to the classes again now that I'm feeling better! Now put your phone down and make something creative! Relax in His presence and enjoy THIS time!